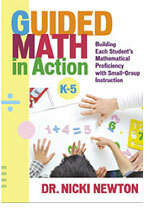 Engaging activities “tend to draw favorable attention or interest.” Do your math units and lessons meet this criteria? Do your students show up everyday ready to learn and excited about the next step on the journey. Are they sitting at the edge of their seats waiting with baited breath for what is going to happen next? In other words, is your math class engaging? What do you do to connect with your students? Remember that these folks are the digital natives. Do you use technology in a variety of ways to connect with them? Do you show videos, play digital games, do math workstations on ipads, pods and laptops? Do you have them play games with each other and in groups? Do you use a variety of tools and manipulatives (even though this is a k site the manipulatives go across the grades)? What do you do exactly to engage your students? Because, according to NAP (2001) engagement matters just as much as all the other stuff!